A large group of boaters at Capers Island were disrupted today by a douchebag on a jet ski. Paul “Turbo” Evans roared in to the relatively calm area where the boaters were relaxing, entering at an excessive speed and coming to an unnecessarily dangerous stop. Now Turbo is killing the vibe, and everyone can’t wait until he leaves. Turbo immediately took his life jacket off so everyone could see his tanning-booth-dark skin and ridiculous tribal tattoos. 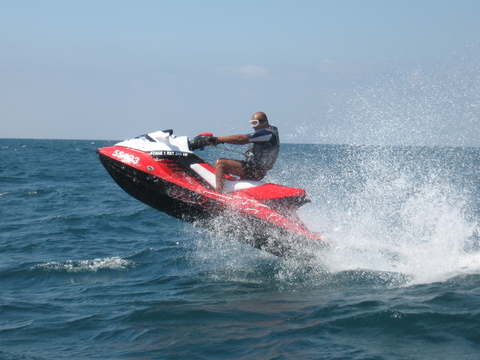 After turning up his techno music to full volume, he removed a handle of Fireball Whisky from his jet ski’s storage compartment and chugged a few gulps directly from it. Turbo became irritated when everyone around him turned down his offer to chug shots with him. Turbo will do an excessive amount of water donuts on his way out to make sure everyone knows how badass he is. He’ll then head over to Henry’s at the downtown market and go home with a trashy girl visiting from Florida. 1 Comment on "Douchebag on Jet Ski Killing the Vibe at Capers Island"
Can any of the relaxers tell me where Turbo relocated to so I can go hang with him?